I sometimes wonder whether the Sunday Times' journo Stephen Jones actually believes what he writes or whether he's simply having a good old chortle at his readers' expense. When he's not upsetting New Zealanders or Irishmen or Scots or Australians, or declaring how fantastically well he expects his native Wales will do at the World Cup, or talking up English rugby in general, or laying into each and every one of the ELVs (when even I can see the benefits of one or two of them), he's usually to be found imploring Andy Robinson, Brian Ashton, Rob Andrew or Martin Johnson (or whoever happens to be selecting the England rugby squad at any given time) not to pick anyone who isn't either gargantuan in build or pushing 30 years old or both (unless, of course, the player in question happens to be a Jones favourite). We've been down this road before of course. A year ago Jones was advocating that England pick the likes of Andy Farrell for the World Cup squad simply because he was big, that being unable to pass the ball shouldn't count against the selection of another big centre in Ayoola Erinle, and that experienced players such as Mike Tindall, Ben Cohen, Ben Kay and Danny Grewcock should be selected despite the fact that they'd spent the previous four years serving up the same old dross whenever they'd pulled on an England shirt. 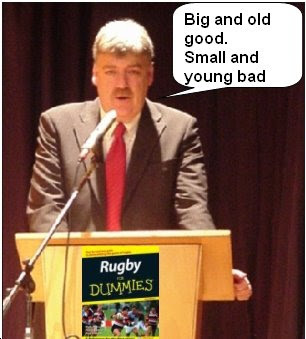 Now, with Martin Johnson set to announce tomorrow his 32 man elite England squad for next season, Jones is at it again. In his Sunday Times article at the weekend, for example, he bemoans the fact that "the single most ruinous aspect of the previous three coaching regimes in England ... is that they discarded people above their mid-20s in favour of tyros, therefore abandoning the lifeblood of experience and, frankly, achieving a set of results that has been on the humiliating side of deplorable." Wrong. If anything the most ruinous aspect of recent regimes has been the opposite i.e. the continued selection of experienced players who have (a couple of matches at the 2007 Rugby World Cup aside) failed, by a country mile, to live up to the standards set by the the 2003 vintage and in this category I would include the likes of Mark Regan, Phil Vickery, Danny Grewcock, Ben Kay, Joe Worsley, Pat Sanderson, Martin Corry, Lewis Moody, Andy Gomarsall, Charlie Hodgson, Mike Tindall, Jamie Noon, Ben Cohen, Josh Lewsey and Mark Cueto amongst others. For good measure I'd also throw in Jonny Wilkinson. If anything, England selection over the past few years (apart from on end of season tours when, obviously, needs must) has, I'd say, been categorised by a lack of faith in young talent. Anthony Allen being ditched after 2 matches is an example, as is the way an 18 year old Mathew Tait was thrown in for an impossible debut in Cardiff and then summarily dumped by Andy Robinson. Where youth has been trusted, returns have been impressive. Both Toby Flood and Shane Geraghty have shown huge promise in an England shirt, Rees and Haskell are beginning to look the real deal in the back row and, of course, Danny Cipriani is even acknowledged by Jones to be a bit special. Full backs/wings: Josh Lewsey, Paul Sackey, Ugo Monye (on the strength of what exactly?) Mike Brown (despite all the evidence of the Auckland Test) and Tom Varndell. Centres: Mike Tindall (pace and creativity not being required, obviously), Olly Barkley, Rickey Flutey (indecently hastily) and Dan Hipkiss . Scrum-halves: Harry Ellis, Richard Wigglesworth (again, despite all available evidence) and, of all people, Shaun Perry (!!!). Props: Andrew Sheridan, Tim Payne, Phil Vickery and Matt Stevens (no arguments, although Gloucester's Nick Wood must be close). Hookers: Dylan Hartley (young, inexperienced, untried but big and deemed worthy by Jones), David Paice and Lee Mears. Locks: Simon Shaw, Tom Palmer, Richard Blaze (see Dylan Hartley) and pensioner Danny Grewcock. 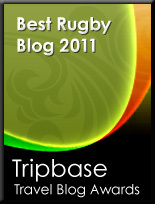 Flankers: James Haskell, Tom Rees, Tom Croft, Lewis Moody and Michael Lipman. No 8s: Jordan Crane and Luke Narraway. Of course, one thing I do agree with is when Jones says that, in reality, it matters not who is selected in the elite 32 if the coaching and management remain as shambolic as in recent times. It's heavily rumoured that, as with the World Cup campaign, in New Zealand the players ended up running the show. Martin Johnson's biggest task, therefore, is to put together a team of experts worthy of coaching the top players in England and a few judicial kicks aimed at the arses of the current coaches wouldn't be a bad start. No Strettle? Shouldn’t you guys be looking for guys with energy? Not in the Stephen Jones selection - like Tait he's not rated, despite his Duracell qualities. Being popular with NZers (even a rough one) probably counts against him too in SJ’s book. Seriously though, are we going to see a few omissions for disciplinary reasons? I guess we'll find out today. If I was MJ - and I am almost physically identical I'll admit ;) - I'd draw a line under the whole episode with a "never again under my watch" warning to all players. Of course, that might change if the Auckland police ever decide to pull their collective finger out. In reality, of the alleged miscreants I think Strettle, Brown and Ojo would, in any event, struggle to make a top 32 - only Danny Care would be a real loss to the squad imho - so if MJ is looking to make a point without having to make any huge sacrifices he could choose to play hard ball. Foden, Sackey, Simpson-Daniel, Lewsey, Banahan, Tait, Hipkiss, Barkley, Flood, Geraghty, Wilkinson, Care, Ellis, Richards, Sheridan, Payne, Wood, Stevens, Vickery, Paice, Mears, Chuter, Borthwick, Shaw, Palmer, Kennedy, Haskell, Narraway, Moody, Rees, Crane, Easter.